Jasmine: How Can A Paper Heart Help You Stay Healthy? How Can A Paper Heart Help You Stay Healthy? The origami heart and paper heart with wings is a wonderful piece of work. It's really neat how the wings are shaped like that and are able to protrude out to the sides the way they do. 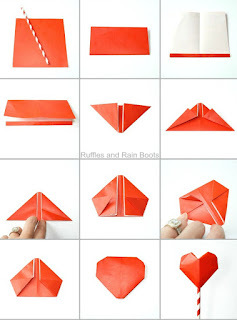 The origami heart with wings is sure to amaze kids and adults alike. It also makes a wonderful "post-it" note that is certain to brighten up someone's day, but you'll have to add your own adhesive. There are a couple of folds that require some maneuvering to accomplish, but they're by no means intricate or difficult. The pictures I took to do an outstanding job in explaining the steps so there should be minimal complications. Surprisingly, there are quite a few diagrams for origami hearts. They range from simple to fairly complex models. Why so many hearts? It might be because a heart is a symbol recognized across many cultures. Giving a paper heart is a simple act that says, "I love you" in many languages. Shown on the left are lucky hearts; "My Heart Sings for You". Francis Ow specializes in paper hearts. His work is on display all over the world and he has a book devoted to folded hearts. Origami hearts are fun to make and can be used for many purposes: to express love on Valentine’s day; to give as a gift on mother’s day or father’s day, or for a sweetheart, or to make amends at whatever time of the year. An important part of education today is teaching children how to take good care of their health. During the 2016 OrigamiUSA convention at St. Johns University in Queens, NY, Dr. Sylvia Cerel-Suhl shared with me a lovely origami using this origami heart. In ten easy folding steps, she demonstrates three key ways of easily maintaining our heart health: Let’s Move! Eat Right, and Don’t Smoke. As a bonus, folding this paper heart also reinforces some basic math and science concepts! In addition to using origami to teach children how to stay healthy, Dr. Cerel-Suhl is pursuing an active campaign to collect one million paper hearts to help share this health message with as wide an audience as possible. Her campaign relates to the Million Heart Initiative, an ambitious US goal to prevent 1 million heart attacks and strokes by 2017.